COWHIDE HIP FLASKS – NEW! 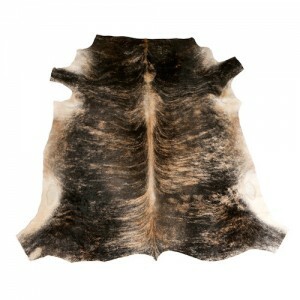 Cowhide is definitely on trend this season. 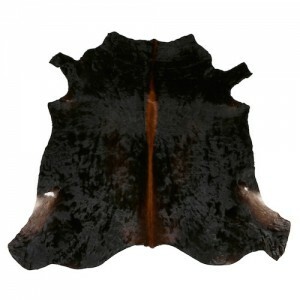 Last week The Times Magazine’s ‘Home!’ section included a full page on all things cowhide in its ‘What to buy now’ advice pages. 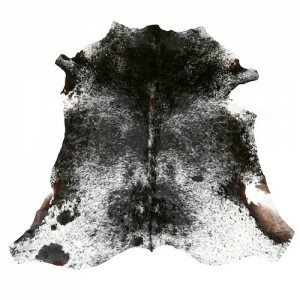 We at Zulucow HQ and you, our classy herd of cowhide aficionados, have been enjoying our exquisite, Nguni cowhide fashion accessories and ‘home’ items for more than 4 years now. Catch up The Times! The Times page features some beautiful cowhide furniture by Timothy Oulton (A smart cowhide armchair and chest of drawers.) Zulucow also has a furniture arm; producing bespoke furniture. Recent commissions include sumptuous glossy ottomans chaise longues and club chairs. 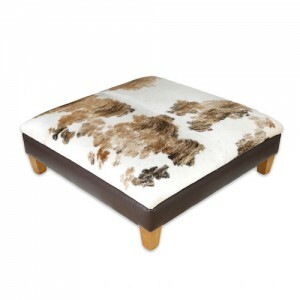 Citycows has row upon rows of mass-produced cowhide footstools which don’t really appeal to me. 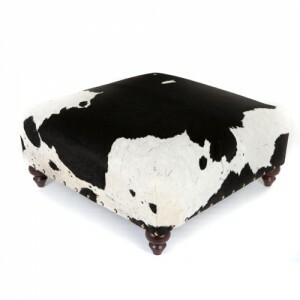 I prefer the loving and detailed attention our long- established upholsterer gives our custom made high end footstool frames; We work together and with our clients, carefully select the studs and feet to go with each piece and its hide. 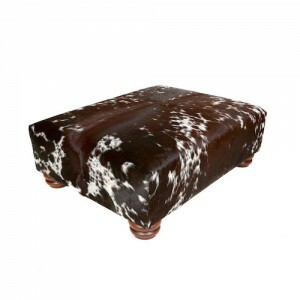 If Abigail Ahern’s beautiful cowhide butterfly chair in The Times, is “rocking a cowboy vibe!” I reckon our Zulucow furniture range rocks a ‘Kenyan cowboy’ vibe!! The Times feature: Invest in A WILD THING’ also featured beanbags from puresheepskin.co.uk at £995. 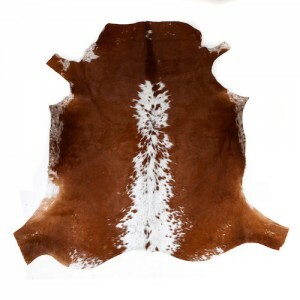 We have just extended our home range to include a few carefully selected, huge Nguni cowhide beanbags . 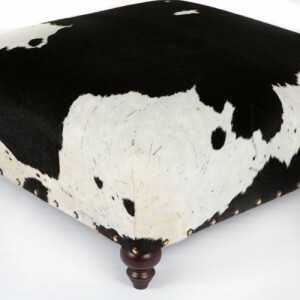 Each beanbag is a statement piece and unique, with its gorgeous panels of soft glossy dramatic Nguni cowhide carefully selected and stitched together by hand, by one of our team of talented artisans. At £599 they’re a bargain! 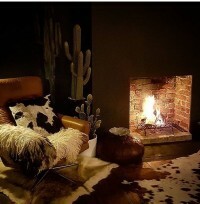 (Celtic & Co has a sheepskin beanbag for £785, Cox and Cox ‘s sheepskin beanbags are: £750. 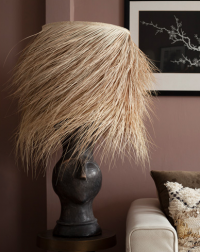 The White Company has a huge sheepskin beanbag coming in at a heft £895! 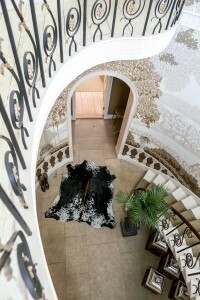 And The English Cowhide Company has a cowhide beanbag fro £599 but it’s not a patch on our unique Nguni cowhide beanbags ‘Out of Africa’ and originating from the indigenous, beautifully patterned Nguni cattle; venerated and bred by the Zulus over centuries, for their dramatic colours, mottles and beauty. We only have 4 beanbags left in stock and due to the time involved in selecting the hides and sewing them by hand; there will sadly be no more beanbags this year! 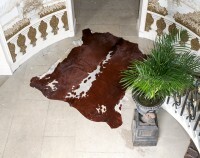 How do you Clean Cowhide Rugs? Join our tribe and sign up to ‘The Bush Telegraph’ (the ZC Newsletter) and receive exclusive offers; sales; new product launches and news from our Zulu craftswomen in South Africa and 15% off your first order.